WASHINGTON, Aug. 31, 2011 - Recent weather events such as Hurricane Irene, the earthquake on the East Coast and other natural disasters highlight the need for Americans to prepare for emergencies. The Federal Emergency Management Agency (FEMA), the American Red Cross, the Ad Council and Google Crisis Response are collaborating to launch a new preparedness web resource, Get Tech Ready, on behalf of the Ready campaign. Released just before the start of National Preparedness Month, this new resource educates individuals and families about how using modern-day technology can help them prepare, adapt and recover from disruptions brought on by emergencies or disasters. A recent American Red Cross survey showed that the internet, including online news sites and social media platforms, is the third most popular way for Americans to gather emergency information and let their loved ones know they are safe. "As technology becomes more a part of our daily lives, people are turning to it during emergencies as well. We need to utilize these tools, to the best of our abilities, to engage and inform the public, because no matter how much federal, state and local officials do, we will only be successful if the public is brought in as part of the team," FEMA Administrator, W. Craig Fugate. "During Hurricane Irene, we saw people using new technologies in many ways, whether it was thousands of people downloading our new shelter finder App or others using our Safe and Well site and social media to let their friends and family know they are OK, " said Gail McGovern, President and CEO of the American Red Cross. "People now have more varied resources available at their fingertips that they can use before, during and after emergencies." Create an Emergency Information Document using the Ready.gov Family Emergency Plan template in Google Docs or by downloading the Ready Family Emergency Plan to record your emergency plans. "Get Tech Ready is a resource that will truly help people in the US and around the world understand how they can use widely available technology to prepare for potential crises," said Nigel Snoud, Product Manager, Google Crisis Response. "We're thrilled to be working with FEMA, the American Red Cross, and the Ad Council on this public service project." "We are delighted to collaborate with FEMA, Google and the American Red Cross to expand our Ready messages through this new web site to educate more Americans about the vital need to get prepared in advance of an potential emergency," said Peggy Conlon, president & CEO of the Ad Council. "The web site will provide access to critical resources to Americans addressing the importance of using technology as part of their individual and family preparedness plans." Launched in 2003, National Preparedness Month is designed to encourage Americans to take steps to prepare for emergencies throughout the year. The Ready campaign was also launched in 2003 by FEMA in partnership with the Ad Council. Since its launch, media outlets have donated more than $900 million in advertising time and space for the PSAs. The new PSAs will air in advertising time that will be entirely donated by the media. The American Red Cross shelters, feeds and provides emotional support to victims of disasters; supplies nearly half of the nation's blood; teaches lifesaving skills; provides international humanitarian aid; and supports military members and their families. The Red Cross is a charitable organization — not a government agency — and depends on volunteers and the generosity of the American public to perform its mission. For more information, please visit http://www.redcross.org/ or join our blog at http://blog.redcross.org. FEMA does not endorse any non-Federal government organizations or products. With Hurricane Irene poised to strike the Northeast this weekend, forecasters are predicting an extreme risk to persons and property. Meteorologists warn of severe and dangerous weather conditions, including torrential rain, strong winds and coastal flooding. Attached above are some helpful tips for preparing for a hurricane feel free to share this information with others. New York State Police are cautioning all residents not to open any emails claiming to be from "uniform traffic ticket", warning the emails contain a computer virus. The emails pretend to be from New York State Department of Motor Vehicles or New York State Police. It asks recipients to open the attached zip file supposedly a copy of the ticket fill it out and send it to a town court. It might contain the subject line "UNIFORM TRAFFIC TICKET" and says "the person described above is charged as follows" The ticket lists the time as 7:25 a.m., the date of the offense as July 5 and describes the violation as "speed over 55 zone." It also says to plead, print out the enclosed ticket and send it to town court, Chatam Hall, P.O. Box 117" The public is being asked not to forward these emails to state or local police. If someone does open the attachment, he or she should update and run antivirus software and take steps to make sure the the computer is secure. From Girl Scouts of Nassau County "Be A Voice for Girls!" We need your help to encourage your Members of Congress to sponsor H.R. 2513/S.1354 today! Kids are surrounded by media. From television to movies to social media and new technologies, kids are consuming up to 10 hours of recreational media each day. Unfortunately, media doesn’t always promote healthy images of girls. Girl Scouts’ research tells us that girls are very influenced by what they see in the media, and that it can have a significant impact on their self-esteem, body image, and leadership aspirations. Provide competitive grants for organizations like Girl Scouts, that provide media literacy programming and leadership development that helps empower girls. Support research to help us better understand the impact of media on youth development. Create a federal task force to develop voluntary recommendations that help the media industry put forward healthy images of women and girls. Be A Voice for Girls! MINEOLA, NY – Nassau County District Attorney Kathleen Rice today said complaints to her office regarding senior citizens being scammed have doubled since last year. To combat the uptick in scams, the DA is launching an educational campaign to help senior citizens protect themselves from those who prey on this vulnerable population. Her efforts will include an educational poster campaign that highlights the “red flags” to look and listen for when a scammer is attempting to fleece a senior citizen out of their money, and an addition to the DA’s website that will give seniors tips on how to avoid being taken advantage of. The District Attorney said that between January 2009 and November 30, 2009, the office received 20 complaints from senior citizens regarding scams. Between January 2010 and November 23, 2010, that number has reached 40. “This increase is a reflection of Nassau County’s increasing senior population and a deteriorating economy,” said Rice. The scams include “Sweepstakes” scams, which can come in the form of a phone call or letter, as well as many others. With the phone call scam, the caller identifies themselves as being from a nationally known sweepstakes company and tells the victim that they have just won a large sum of money. The catch comes when they instruct the victim to wire money to pay taxes on the winnings, before the “prize” is sent. Often the victim is sent a letter containing a realistic-looking check announcing that they have won a contest. The victim is told to deposit the check and then wire a portion of the money back to the company. The victim doesn’t realize the check they have deposited is a fraud until it’s too late. Rice said that many of the scams and fake checks may seem legitimate. The DA said her office is also receiving complaints about a new type of scam in which the victim receives a phone call from someone claiming to be a friend of a grandchild and then tells them to wire bail money to Canada because the grandchild has been arrested. The scammers count on the caring grandparents to send the money, with few questions asked. The educational posters will be placed in locations where a person might go to wire money, such as supermarkets, check cashing stores and senior centers. The posters will be paid for by using money forfeited to the DA’s office by convicted criminals. PHONE CALL ASKING FOR BAIL: The request comes from a caller requesting a large sum of money in order to bail a grandchild or loved one out of jail. One victim of this scam said the caller concocted a whole story that her “grandson was with a friend driving in Buffalo, New York and crossed the Canadian border and was arrested for drug possession.” He instructed her to wire money to Canada to post bail. EMAIL ASKING FOR BAIL: The request comes from a friend or loved one’s email address to wire money. Residents of Nassau County receive emails from the account of a friend or loved one claiming to be in another country and requesting a large sum of money for a plane ticket, bail money, or other emergency expenses. In reality, a scammer has obtained control of the sender’s email account and contact list/address book, and the victim sends the money directly to the scammer. SWEEPSTAKES SCAM: The victim receives a letter stating that they’ve won a contest, often from a scammer using a variation of a legitimate organization’s name. Enclosed is a check, usually less than $5,000, drawn on an out-of-state bank account. The victim is instructed to call a phone number where they are instructed to deposit the check, saying the money is to pay the taxes on their prize, and wire the money back to the organization. The victim sends the money to the scammer, and then the bank dishonors the original check. The phone number scammers typically use in this scam has an Ontario, Canada area code. SECRET SHOPPER SCAM: Victims responding to an ad for secret shopper employment receive a check in the mail for approximately $3,985 and are instructed to deposit the check into their bank account. The victims are told to conduct a survey of retail stores, for which they will “earn” $600 for their work. The last requirement is to send the balance of the initial check, approximately $3,000, to Canada or out-of-state via Money Gram or Western Union. The money is sent before the victim can be informed by their bank that the initial check was counterfeit. The thief is counting on the victim’s bank to make the money available before the check is discovered to be fraudulent. BLOATED CHECK SCAM: The victim, typically someone selling personal property on a Web site such as Craigslist, is contacted by a “buyer.” The buyer sends the victim money orders for more than the purchase price, and then asks the victim to wire back the balance of the bloated check. Victims often find out too late that the initial payment is counterfeit, and they’ve just wired their own money to a scammer. PHISHING SCAM: An email or phone call is received by the victim who is led to believe it came from their bank. The call or email asks for the victim to verify personal information such as Social Security number and account numbers. A legitimate bank will NEVER ask for this information. JURY DUTY SCAM: Victims are contacted by phone by a caller claiming to be an officer of the court. The “officer” says the victim failed to show up for jury duty and a warrant has been issued for their arrest. Once the victim says that they never received a jury duty notice, the caller will ask for personal information to verify. The jury duty scam is on the rise. Anyone you’ve never met or spoke to on the phone that is asking for money through the Internet or to be wired to them is scamming you. Always thoroughly research anyone you meet on a social-networking or Internet dating website. Be very suspicious if you are asked to send anything through a third party. Be very suspicious if an email has misspellings, broken English, or any grammatical anomalies. An Ontario, Canada area code. Rice adds that in order to prevent being the victim of identity theft it is a good idea for consumers to request and view their credit reports from Experian, Equifax and Trans Union. Anyone can obtain a FREE credit report from each of the three bureaus once a year (www.annualcreditreport.com). The credit report will indicate if there are fraudulent credit inquiries and/ or fraudulent credit accounts. The DA’s office also has an ongoing program that is presented to senior groups throughout the year that educates the audience on common scams. To schedule one of these presentations for your group, call 516-571-3505. In effort to best prepare the residents of Nassau County against the threats of hurricanes, County Executive Mangano with the Office of Emergency Management has produced a Hurricane video which is 5 minutes in length. 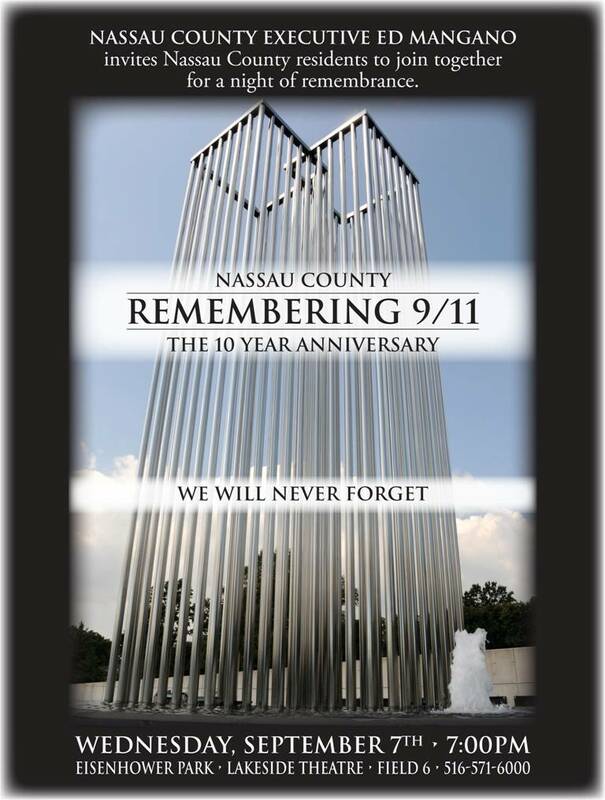 We encourage you to please view the video at www.youtube.com/nassaucountyoem. Through this link you can also embed the video on your website and forward the link to others. During the Summer season and moving into Fall, we all notice things in our neighborhood that need to be addressed. A street light is out, a dead tree, a pothole a storm sewer that is blocked with trash. And the list goes on. Our neighborhoods matter. If there's one thing County Legislator Ciotti has carved out a strong reputation on, it's the fact that he has helped revitalize our community. The new new planters on Dutch Broadway, new street lights, Officer Matthew Giglio Memorial Plaza, Elmont Road trees and lights, new sidewalks, new traffic lights, street signs and a whole lot more. Let's take the next step in our community and do more to improve our neighborhoods. Join his effort to improve our community. Crime Stoppers and the Nassau County Police Department are seeking information in connection with a Petit Larceny that occurred in West Hempstead on Saturday June 11, and June 12, 2011 Stoppers and the Nassau County Police Department are seeking the public’s help in identifying the subject wanted in connection with a Petit Larceny which occurred in West Hempstead, New York within the confines of the Fifth Precinct. Stop & Shop located at 50 Cherry Valley Avenue, West Hempstead, New York. On Saturday, June 11, 2011 at approximately 10:30 PM, the subject removed cosmetic items (value $357.12) before passing all points of purchase and exiting the store without making payment. On Sunday, June 12, 2011 at approximately 6:30 AM, the subject removed chewing gum (value $101.99) before passing all points of purchase and exiting the store without making payment. Crime Stoppers is asking anyone who can identify the subject or with any information about this crime to call our toll free hotline: 1-800-244-TIPS (8477). All calls will be kept confidential. Crime Stoppers is offering a reward for information leading to an arrest. YOU DON’T HAVE TO REVEAL YOUR IDENTITY TO HELP SOLVE THIS CRIME.